Through 35 games this season, the Ottawa Senators seem to be sticking around. To be frank, that’s quite a surprise. This past off-season was tumultuous, to say the least, from the release of a bizarre, awkward promotional video featuring owner Eugene Melnyk and defenceman Mark Borowiecki, to assistant general manager Randy Lee stepping down due to harassment charges, and, of course, the trade of captain Erik Karlsson for basically peanuts. Plus, Ottawa had to surrender either their 2018 or 2019 first round draft selection to the Colorado Avalanche because of the Matt Duchene deal (keeping their pick to select Brady Tkachuk has, at least so far, seemed to be the correct move). All this to say, not much was expected on the ice in the nation’s capital this season. And yet, nearly halfway through 2018-19, the ‘Pesky Sens’ are just one game below .500 — good enough to put them just five points out of the eighth and final playoff spot, despite having allowed the most goals in the entire NHL (135). 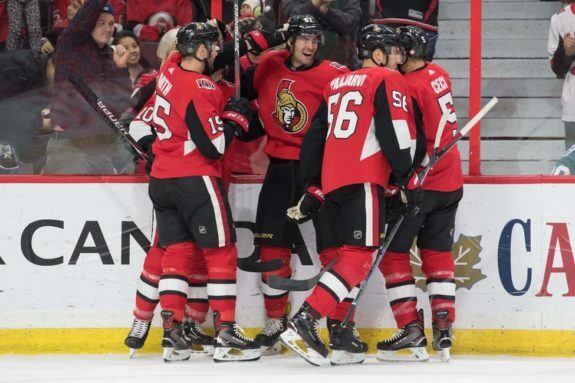 While the Sens are 15-16-4 overall on the season, they are a more than respectable 11-5-3 at home, thanks to their overtime win over the league’s fourth-best team last night. How can the same team be six games over .500 at home and 4-11-1 on the road? Teams generally are better at home than on the road, mostly due to the advantage of having last change. Only 12 of 31 NHL teams have a road points percentage that is greater than .500, while 25 of 31 teams have a home points percentage that is greater than .500. But Ottawa’s discrepancy is extreme, and perhaps, unique. Their 0.658 points percentage at home is 14th in the NHL, while their 0.281 road points percentage is third-worst. In addition to points in the standings, the Senators’ special teams road versus home splits have also been Jekyll and Hyde-like thus far. At home, their power play is fifth-best at 27.9 percent. On the road, it’s fifth-worst, at 13.3 percent. The question is, which one should fans expect moving forward? There is another possibility for why the Sens have such a drastically different record at home versus on the road: luck. All season long, the Sens have been given up too many shot attempts during 5-on-5 play and not generating enough chances themselves. This has happened both at home and on the road. In the chart above, where the X-axis and Y-axis meet, is the league average. 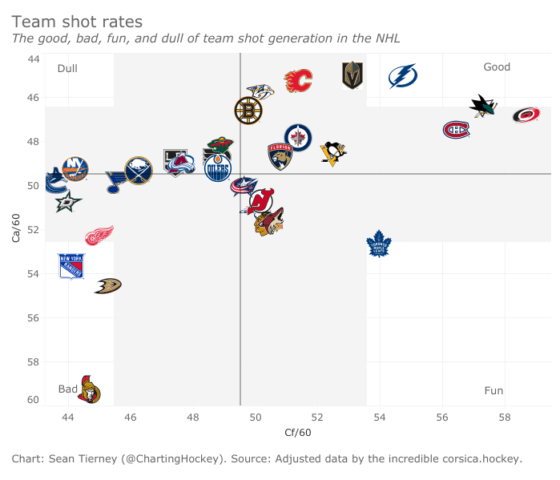 Where the Sens are (bottom left corner, next to ‘bad’) indicates they’ve both given up the most shot attempts in the NHL at 5-on-5 (CA/60 is Corsi Against per 60 minutes), and generated amongst the bottom-five in the league when it comes to Corsi For. The thing is, at home, they’ve still been scoring at even strength. They have 42 goals for at home during 5-on-5 play, which is sixth-best in the NHL. It’s quite likely converting at that rate is unsustainable, given the chart below. These numbers, taken from NaturalStatTrick.com, show the discrepancy in the Senators actual goal totals vs. expected goal totals at home. The nugget to take from this chart is the discrepancy between the first column and everything else. 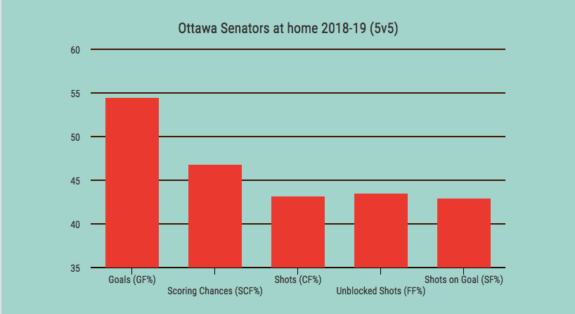 While the Sens’ GF% at home is nearly 55, the number of shots generated, the number of shots that don’t get blocked and the number of shots that make it on net are all below 45 percent, while the number of scoring chances created is barely above 45 percent. As the table shows, Ottawa’s ability to generate offence is at the bottom of the league in nearly every category, both at the Canadian Tire Centre and away from it. The only significant difference is in their actual number of goals scored. The fact they’ve scored around the league average at home despite generating a below average number of chances (while at the same time allowing an insane amount of scoring opportunities against) is not a recipe for success. How long can they keep winning at home if they allow Craig Anderson and Mike McKenna to be shelled every night?